Treat yourself and your favorite dining companion to an elegant steak dinner without creating a big mess, using this one-pan recipe for delicious steak and potatoes. Skip the potatoes and sauté mushrooms instead for a healthier version of this steak dinner! Per Serving: 1168 calories; 88g fat; 30.2g carbohydrates; 63g protein; 225mg cholesterol; 1398mg sodium. One pan, packed with serious flavor. I sautée mushrooms and asparagus in the drippings. Easy clean up and quick. This steak dinner was incredible! I made it for a date night and hubby was super impressed. 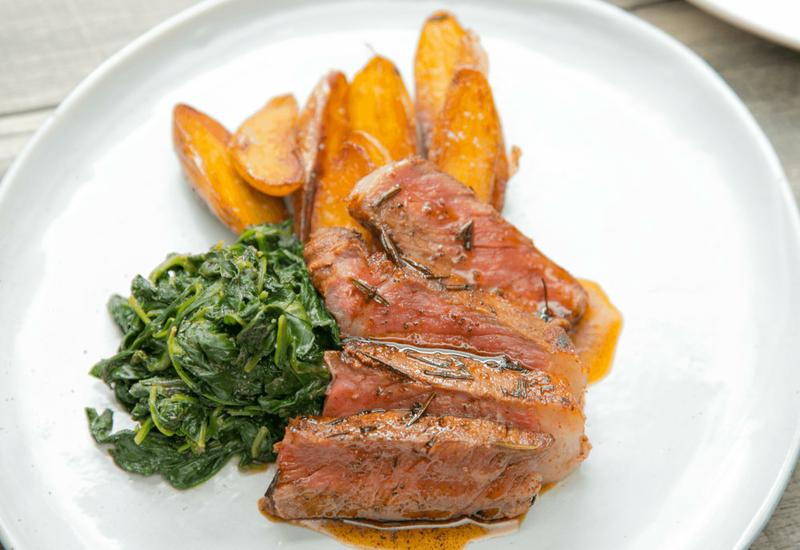 Absolutely delicious, tender meat, yummy potatoes, and healthy, flavorful spinach. Definitely going to make this again! Yes! Tried this and loved it. Great tasting steak cooked to perfection with these simple steps. Loved everything about this dish and only had to use one pan! This was a fantastic steak dinner that paired perfectly with sautéed mushrooms (instead of potatoes). It turned out incredibly tender! If you are not using New York strip steak for this recipe then I recommend using only a T-bone or porterhouse steak. We've tried this recipe out on all three cuts, that's how much we love it. Delicious! We did mashed potatoes using Yukon gold potatoes and it paired perfectly with this delicious steak. We usually do a simple salt and pepper rub for the steak, but I really liked this garlic, paprika, and cayenne blend. I’m an entry level cook (at best) so, I stuck to the recipe and everything came out great!